Sanne and Lemme are siblings in a traditional reindeer-herding family. Big brother Lemme loves dirt biking and is eagerly looking forward to the new dirt bike track now under construction. In town, his sister Sanne meets a delirious man who babbles something incomprehensible about the “devil’s child.” After their father’s outburst at the dinner table about how recklessly the dirt bike community is destroying the grazing lands with the new dirt bike track, Lemme leaves in a huff. Sanne follows and hops onto the dirt bike behind him. After an unexpected, scary happening, the teenagers disappear without a trace. Back at home their parents are consumed by grief and despair. Where are they, what happened? All that was found was Lemme’s dirt bike at the construction site for the new track. In the novel In Between Worlds, the writer weaves together elements of contemporary reality, political struggles and Sami beliefs and myths, to form a mysterious twilight world. “In Between Worlds” is a translation of Máret Ánne Sara’s debut book, “Ilmmiid gaskkas”, published in the Sámi language in 2013 and nominated for the Nordic Council Children and Young People´s Literature Prize in 2014. 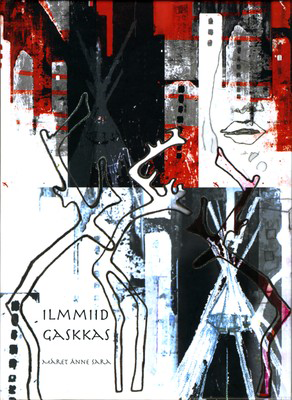 The follow-up novel “Doaresbealde doali” came out in Sámi in 2014. Order the book in Norwegian! Order the book in English!